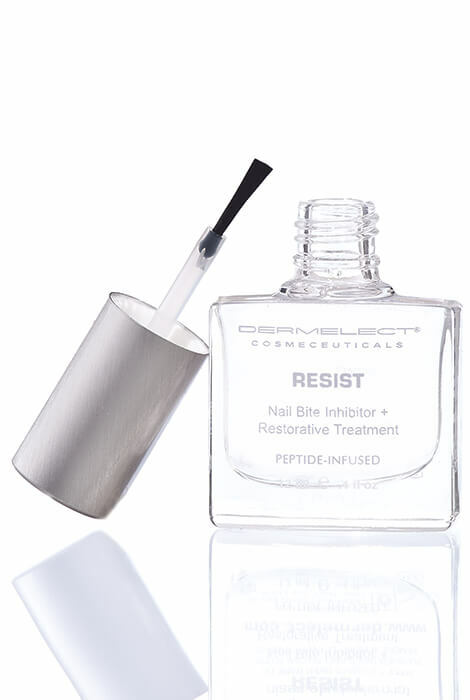 Discourage nail biting and thumb-sucking in adults or children with this Dermelect® Resist Nail Bite Inhibitor + Restorative Treatment that also restores healthy nails. The distinct bitter taste successfully discourages putting hands in the mouth. 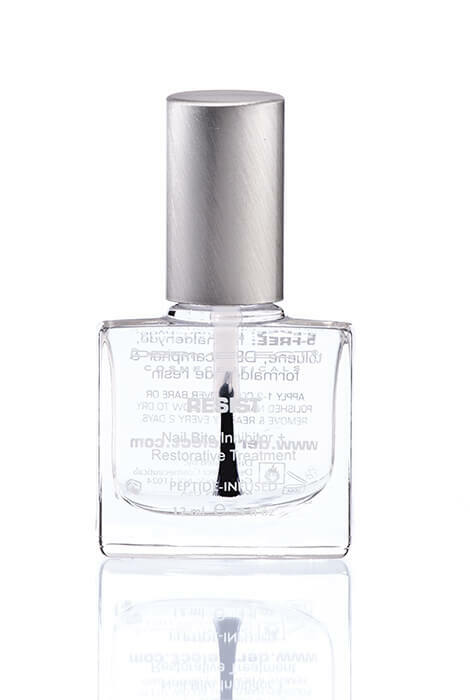 In addition, the patent-pending formula is the first peptide-infused nail strengthening treatment that works to restore damaged nails and cuticles while promoting healthy nail growth. This nail biting treatment restores protein levels to damaged nails by utilizing a pure extraction of keratin peptide from New Zealand sheep's wool. The result is unprecedented age-defying, strengthening and softening properties to the nails and for the skin. Use as a base coat or a high-shine top coat. Recommended for adults and children 3 and over. To use, apply 1-2 coats as a base coat or over nail polish and allow to dry. Remove and repeat the application every two days. Free from formaldehyde, toluene, DBP, camphor and formaldehyde resin. To use, apply 1-2 coats as a base coat or over nail polish and allow to dry. Remove and repeat the application every two days. Apply 1-2 coats as a base coat or over nail polish and allow to dry. Remove and repeat the application every two days. For healthier nails and cuticles, we recommend using in conjunction with the Dermelect Rejuvenail Nail Strengthening Cream. BUTYL ACETATE, ETHYL ACETATE, MEK, ADIPIC ACID/NEOPENTYL GLYCOL/ TRIMELLITIC ANHYDRIDE COPOLYMER, CELLULOSE ACETATE PROPIONATE, ISOPROPYL ALCOHOL, DENATONIUM BENZOATE, CARTHAMUS (SAFFLOWER FLOWER) TINCTORIUS SEED OIL, ALLIUM SATIVUM (GARLIC) BULB EXTRACT, AQUA (AND) HYDROLYZED KERATIN, TOCOPHERYL ACETATE, CALCIUM PANTOTHENATE, N-BUTYL ALCOHOL, CI60725. The only thing that I have found that does the job!